Coordinates: 53°10N 99°0E – TrammelAh, this was one warm, sunny day. It seemed, the heaven could not be any clearer and the sun burnt down on me and my old friend and companion Snuggletuff. We rode along the Vesper beach, watching the beatiful ladies being grilled by the powerful sunlight, we even saw a miner, digging for high-quality sand in between the giggling ladies…well the ladies looked quite crispy, but well…I had a tower to reach ! 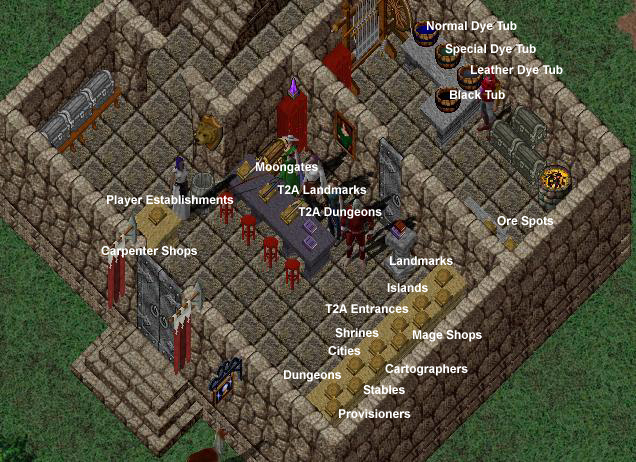 Just some more minutes of riding Snuggletuff lead me to the tower which is known as Jafar´s Rune Library. Well, a library is always interesting ! 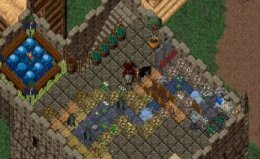 Snuggletuff was thirsty, and I was too, so we decided to start from the roof of the tower, where, as rumours tell, a Pool and a nice recreation area should be located. And my, that place is beautiful indeed ! A little waterfall flushing a very nice brook is the centre of the recreation area, which is designed like a small jungle. On the west-side there is a whirlpool and you bet I was tempted to jump into the water and let Lord British be a good man ! After Snuggeltuff drank some of the crystal-clear water from top of the little bridge over the brook, we were ready to visit the other floors. 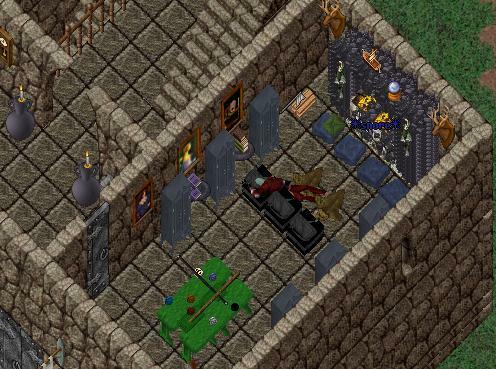 Passing the alchemist´s workplace, we reached the owner´s bedroom (unlocked ! ), which is very comfortable as to its looks and well equipped with a sink and something I just had to use at that very moment: a shower ! Cold, fresh water refreshed me like no bath had done before…that was a new experience, since I never saw, nor used, a shower in all over Britannia. And yes, before you ask…I take a bath once in a while, hehe. On the first floor we found a large fireside, which is very impressive. right in front of it there are many cushions inviting for a little nap..and who am I to decline invitations ??? 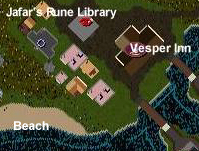 You might ask yourself now, why this place is called a Rune Library, since we, up to now, did not talk about any runes. Well, Snuggletuff and I went down the stairs to the ground floor again. We found many runebooks with very special locations, moongates, player-run-establishments and even some quite hidden ore-spots. 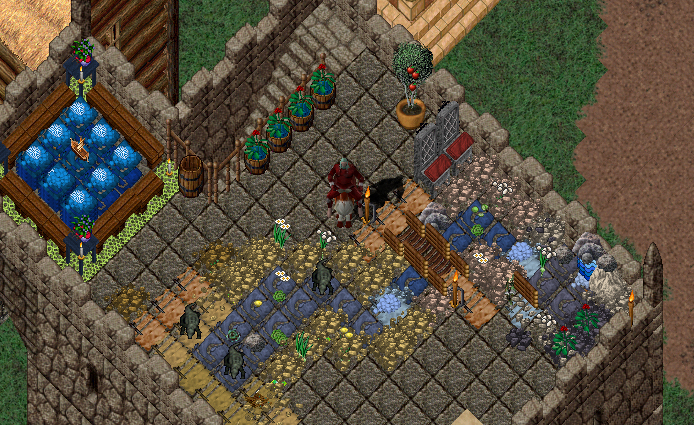 While I was rummaging all the books to find out where they would lead me, Snuggletuff decided to be thirsty again and wandered off to drink from the dye tubs that are locked down in the backroom (that´s also where the ore-runebooks are !). I was able to stop him before he drank from either the normal tub, the special dye tub, the black tub and the leather dye tub, so I had not to fear my little friend to be sick from that ingredients. Snuggletuff and I talked through what we had seen in this building and decided to come here more often, not only because of the bikini girls at the beach, but also because we were sure, that many a travel could be started from this place !